Objective To assess whether the completeness of reporting of health research is related to journals’ endorsement of reporting guidelines. 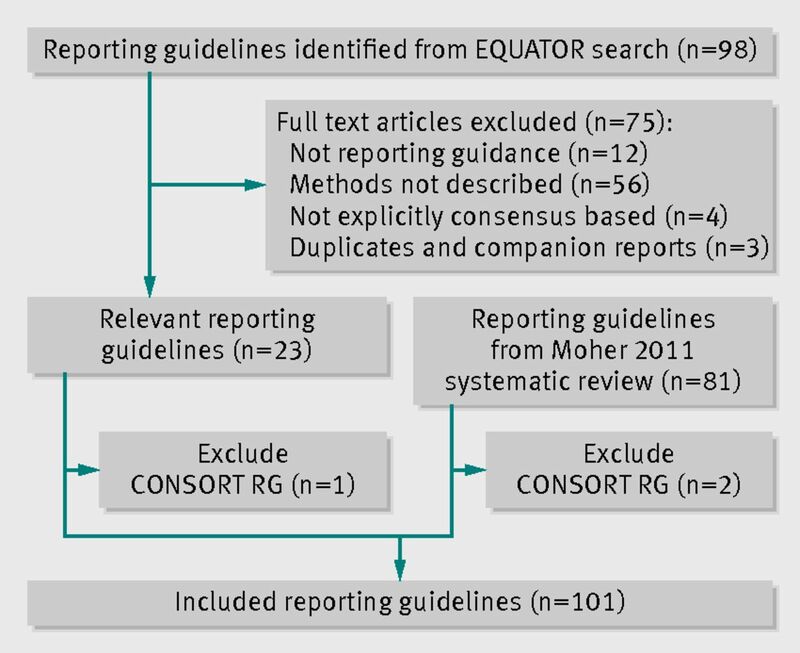 Data sources Reporting guidelines from a published systematic review and the EQUATOR Network (October 2011). Studies assessing the completeness of reporting by using an included reporting guideline (termed “evaluations”) (1990 to October 2011; addendum searches in January 2012) from searches of either Medline, Embase, and the Cochrane Methodology Register or Scopus, depending on reporting guideline name. Study selection English language reporting guidelines that provided explicit guidance for reporting, described the guidance development process, and indicated use of a consensus development process were included. The CONSORT statement was excluded, as evaluations of adherence to CONSORT had previously been reviewed. English or French language evaluations of included reporting guidelines were eligible if they assessed the completeness of reporting of studies as a primary intent and those included studies enabled the comparisons of interest (that is, after versus before journal endorsement and/or endorsing versus non-endorsing journals). Data extraction Potentially eligible evaluations of included guidelines were screened initially by title and abstract and then as full text reports. If eligibility was unclear, authors of evaluations were contacted; journals’ websites were consulted for endorsement information where needed. The completeness of reporting of reporting guidelines was analyzed in relation to endorsement by item and, where consistent with the authors’ analysis, a mean summed score. Results 101 reporting guidelines were included. Of 15 249 records retrieved from the search for evaluations, 26 evaluations that assessed completeness of reporting in relation to endorsement for nine reporting guidelines were identified. Of those, 13 evaluations assessing seven reporting guidelines (BMJ economic checklist, CONSORT for harms, PRISMA, QUOROM, STARD, STRICTA, and STROBE) could be analyzed. Reporting guideline items were assessed by few evaluations. Conclusions The completeness of reporting of only nine of 101 health research reporting guidelines (excluding CONSORT) has been evaluated in relation to journals’ endorsement. Items from seven reporting guidelines were quantitatively analyzed, by few evaluations each. Insufficient evidence exists to determine the relation between journals’ endorsement of reporting guidelines and the completeness of reporting of published health research reports. Journal editors and researchers should consider collaborative prospectively designed, controlled studies to provide more robust evidence. Systematic review registration Not registered; no known register currently accepts protocols for methodology systematic reviews. An important role for editors is to ensure that research articles published in their journals are clear, complete, transparent, and as free as possible from bias.10 In an effort to uphold high standards, journal editors may feel the need to endorse multiple reporting guidelines without knowledge of their rigor or ability to improve reporting. The CONSORT statement is a well known reporting guideline that has been extensively evaluated.11 12 13 14 15 A 2012 systematic review indicated that, for some items of the CONSORT checklist, trials published in journals that endorse CONSORT were more completely reported than were trials published before the time of endorsement or in non-endorsing journals.16 17 A similar systematic review of other reporting guidelines may provide editors and other end users with the information needed to help them decide which other guidelines to use or endorse. Our objective was to assess whether the completeness of reporting of health research is related to journals’ endorsement of reporting guidelines other than CONSORT by comparing the completeness of reporting in journals before and after endorsement of a reporting guideline and in endorsing journals compared with non-endorsing journals. For context, the box provides readers with definitions of terms used throughout this review. Our methods are available in a previously published protocol.18 This systematic review is reported according to the PRISMA statement (appendix 1).19 Any changes in methods from those reported in the protocol are found in appendix 2. We first searched for and selected reporting guidelines. We included reporting guidelines from Moher et al’s 2011 systematic review,9 and we screened guidelines identified through the EQUATOR Network (October 2011; reflects content from PubMed searches to June 2011). We included English language reporting guidelines for health research if they provided explicit text to guide authors in reporting, described how the guidance was developed, and used a consensus process to develop the guideline. After removing any duplicate results from the search yield, we uploaded records and full text reports to Distiller SR. Two people (AS and LS) independently screened reporting guidelines. Disagreements were resolved by consensus or a third person (DM). Many developers of reporting guidelines have devised acronyms for their guidelines for simplicity of naming (for example, CONSORT, PRISMA, STARD). Some acronyms, however, refer to words with other meanings (for example, STROBE). For this reason, we used a dual approach to searching for evaluations of relevant reporting guidelines. We searched for reporting guidelines with unique acronyms cited in bibliographic records in Ovid Medline (1990 to October 2011), Embase (1990 to 2011 week 41), and the Cochrane Methodology Register (2011, issue 4); we searched Scopus (October 2011) for evaluations of all other guidelines (that is, ones with alternate meanings or without an acronym). We did addendum searches in January 2012. Details are provided in appendix 3. In addition, we contacted the corresponding authors of reporting guidelines, scanned bibliographies of related systematic reviews, and consulted with members of our research team for other potential evaluations. We included English or French language evaluations if they assessed the completeness of reporting as a primary intent and included studies enabling the comparisons of interest (after versus before journal endorsement and/or endorsing versus non-endorsing journals). Choice of language for inclusion was based on expertise within our research team; owing to budget constraints, we could not seek translations of potential evaluations in other languages. After removing any duplicate results from the search yield, we uploaded records to Distiller SR. We first screened records by title and abstract (one person to include, two people to exclude a record) and then in two rounds for the full reports (two reviewers, independently) owing to the complexity of assessing screening criteria and using a team of reviewers. Disagreements were resolved by consensus or a third person. Where needed, we contacted authors of evaluations (n=66) or journal editors (n=48) for additional information. One person (from among a smaller working group of the team) processed evaluations with responses to queries to authors and journal editors and collated multiple reports for evaluations. For included reporting guidelines, one person extracted guidelines’ characteristics. For evaluations of reporting guidelines, one person extracted characteristics of the evaluation and outcomes and did validity assessments; a second person verified 20% of the characteristics of studies and 100% of the remaining information. We contacted authors for completeness of reporting data for evaluations, where needed. Variables collected are reflected in the tables, figures, and appendices. As no methods exist for synthesizing validity assessments for methods reviews, we present information in tables and text for readers’ interpretation. Our primary outcome was completeness of reporting, defined as complete reporting of all elements within a guidance checklist item. As not all authors evaluated reporting guideline checklist items as stated in the original guideline publications, we excluded any items that were split into two or more separate items or reworded (leading to a change in meaning of the item). Comparisons of interest were endorsing versus non-endorsing journals and after versus before endorsement. The first comparison functions as a cross sectional analysis, and years in which articles from endorsing journals were published depicted the years of comparison with articles from non-endorsing journals. We used the publication date of the reporting guideline as a proxy if the actual date of endorsement was not known. For the second comparison, we included before and after studies from the same journal only if a specific date of endorsement was known. We also examined the publication years of included studies to ensure that years were close enough within a given arm for reasonable comparison. As a result, not all studies included in the evaluations were included in our analysis. We analyzed the completeness of reporting in relation to journals’ endorsement of guidelines by item (number of studies within an evaluation completely reporting a given reporting item) and by mean summed score (we calculated a sum of completely reported guideline items for each study included in an evaluation and compared the mean of those sums across studies between comparison groups); we used a mean summed score only when evaluations also analyzed in this manner. We used risk ratios, standardized mean differences, and mean differences with associated 99% confidence intervals for analyses, as calculated using Review Manager software.20 In most cases, we reworked authors’ data to form our comparison groups of interest for the analysis. Secondary outcomes were methodological quality and unwanted effects of using a guideline, as reported in evaluations. We present data for these outcomes in narrative form. Our literature search included evaluations of the CONSORT guidelines, but we excluded those during the screening process. We located 17 225 records through bibliographic databases and an additional 49 records from other sources (bibliographies, web search for full text reports of conference abstracts, and articles suggested by authors of reporting guidelines and members of the research team). After removing companion (known multiple publications) and duplicate reports, we screened a total of 15 249 title and abstract records. Of those, 1153 were eligible for full text review. After two rounds of full text screening, contacting authors, and seeking journal endorsement information, we included a total of 26 evaluations (fig 3⇓).122 123 124 125 126 127 128 129 130 131 132 133 134 135 136 137 138 139 140 141 142 143 144 145 146 147 A list of potential evaluations written in languages other than English or French is provided in appendix 4. Appendix 5 descriptively summarizes included reporting guidelines according to the focus of the guideline and the content area the guideline covers. Among included guidelines were those covering general health research reports; animal, pre-clinical, and other basic science reports; a variety of health research designs and types of health research; and a variety of content areas. Tables 1⇓ and 2⇓ show characteristics of the included evaluations. The most frequent content focuses of evaluations were diagnostic studies (7/26; 27%), drug therapies (6/26; 23%), and unspecified (5/26; 19%); evaluations spanned a variety of biomedical areas. Funding was most frequently either not reported (13/26; 50%) or provided by a government agency (7/26; 27%), and the role of the funder in the conduct of the evaluation was not reported in most evaluations (22/26; 85%). Two thirds of the evaluations provided a statement regarding competing interests or declared authors’ source(s) of support (17/26; 65%). Corresponding authors of evaluations were located in nine countries; 37% (10/27) of corresponding authors were in the United Kingdom. For each included evaluation, tables 3⇓ and 4⇓ show the number of studies relevant to our assessments, their year(s) of publication, and the number of journals publishing the relevant studies. Tables 5⇓ and 6⇓ present information on the extent of journals’ endorsement and whether the date of endorsement was provided by evaluation authors, journal websites, or editors. Tables 3⇑ and 4⇑ show validity assessments for the comparisons; supports for those judgments are in appendix 6. 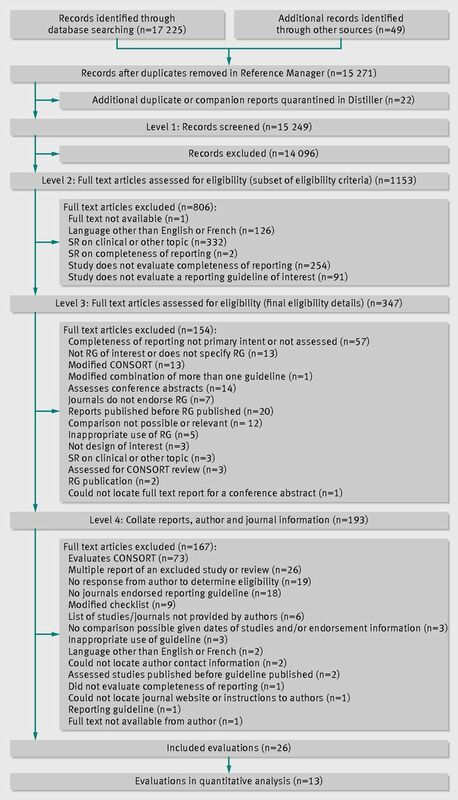 Table 3⇑ provides information on evaluations for the endorsing versus non-endorsing journal comparison; table 4⇑ includes information for those evaluations that included studies pertaining to the after versus before endorsement comparison. More than half (15/26; 58%) of the evaluations used at least two people to assess the completeness of reporting. Selective reporting does not seem to be a problem, as most evaluations (20/26; 77%) assessed the number of reporting items as stipulated in the methods section. A comprehensive search strategy for locating relevant studies was not reported for most evaluations (5/26; 19%); an evaluation with the intention of evaluating reports from specific journals in a specified time period would have been deemed adequately comprehensive. When comparing endorsing journals with non-endorsing journals, half of the evaluations (14/25; 56%) had a similar number of studies per journal in the comparison groups; when comparing journals after and before endorsement, less than half of the evaluations (4/10; 40%) were balanced for the number of studies per journal in the comparison groups to account for a potential “clustering” problem. When comparing journals after and before endorsement, most evaluations (7/10; 70%) had studies in the “before” arm that were published before the reporting guideline was published, possibly confounding the evaluations. Of the 26 included evaluations, we were able to quantitatively analyze 13; we did not have access to the raw data for the remaining evaluations. The CONSORT extensions for herbal interventions and journal/conference abstracts reporting guidelines were covered by one evaluation each, but raw data were not available for our analysis. Because of the few evaluations with available data, we were unable to do pre-planned subgroup and sensitivity analyses and assessments of funnel plot asymmetry.18 Data described below pertain to overall analyses of checklist items by guideline; individual analyses for each checklist item and mean summed score are provided in appendix 7. Analyzed by checklist item, the CONSORT extension for harms (10 items), PRISMA (27 items), STARD (25 items), and STROBE (34 items) reporting guidelines were evaluated on all items; a subset of items was analyzed for the BMJ economics checklist (19/35 items) and STRICTA (18/20 items) guidelines. Most items were assessed by only one evaluation; STARD items were assessed by two to four evaluations and PRISMA by mostly two to three evaluations (figures 4⇓, 5⇓, 6⇓, 7⇓, 8⇓, and 9⇓). Relatively few relevant studies were included in the assessments (median 85, interquartile range 47-143, studies). Across guidelines, almost all items were statistically non-significant for completeness of reporting in relation to journal endorsement (figures 4⇓, 5⇓, 6⇓, 7⇓, 8⇓, and 9⇓). The CONSORT extension for harms, PRISMA, STARD, STRICTA, and STROBE were each analyzed by mean summed score, for which some evaluations used all items and others used a subset of items (table 7⇓). Guidelines were assessed by a range of one to three evaluations. Relatively few relevant studies were included in the assessments (median 102, interquartile range 88-143, studies). Analyses for completeness of reporting in relation to journal endorsement for mean summed scores were statistically non-significant for all except PRISMA (table 7⇓). Analyzed by checklist item, STROBE (34 items) and PRISMA (27 items) were the only reporting guidelines with all items evaluated; the QUOROM (1/17 items), STARD (1/25 items), and STRICTA (17/20 items) guidelines were evaluated for a subset of items. All were assessed by one evaluation each with the exception of PRISMA. Relatively few relevant studies were included in the assessments (median 20, interquartile range 19-64, studies; figures 10⇓, 11⇓, 12⇓, 13⇓, and 14⇓). Analyses for completeness of reporting in relation to endorsement were statistically non-significant for each checklist item. PRISMA (all checklist items), STRICTA (item subset), and STROBE (all checklist items) reporting guidelines were analyzed by a mean summed score and by one or two evaluations each. Relatively few relevant studies were included in the assessments (median 20, interquartile range 18-50, studies), and analyses for completeness of reporting in relation to endorsement for mean summed scores were statistically non-significant (table 8⇓). 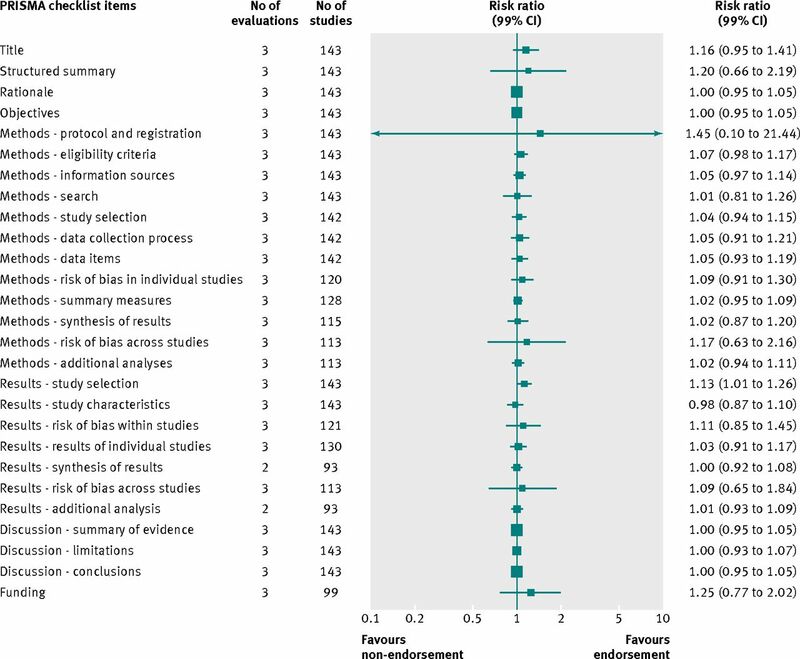 Nine of 26 evaluations assessed the methodological quality of included studies (table 9⇓): one economics evaluation,122 one evaluation assessing randomized trials of herbal medicines,127 five systematic review evaluations,129 130 143 144 145 and two evaluations assessing diagnostic studies.131 137 Relatively few studies per evaluation were included in the assessments. The three more recently published systematic review evaluations used AMSTAR, whereas the older two evaluations used the Oxman and Guyatt index. The two diagnostic evaluations used separate, non-overlapping criteria. Given the different methodological areas and tools represented by the evaluations, a meaningful synthesis statement was not possible. None of the included evaluations reported on unwanted effects of reporting guideline use. We reviewed the evidence on whether endorsement of reporting guidelines by journals is associated with more complete reporting of research. Although we identified a large number of reporting guidelines, very few evaluations of those reporting guidelines were located and provided information to enable an examination with respect to endorsement. This is the first systematic review to comprehensively review a broad range of reporting guidelines. We sourced these reporting guidelines from the EQUATOR Network and another systematic review characterizing known, high quality guidelines. We gave careful consideration to the parameters required to enable our comparisons of interest and made a considerable effort to locate evaluations, including the re-analysis of others’ data. As exemplified by the volume of literature we had to screen, searching is complex with methods reviews. No search filters or established bibliographic database controlled vocabulary terms exist, especially for reporting guidelines. For many methods reviews, the particular studies of interest are often embedded in other studies. The time consuming task of screening leads to a very low yield. Although systematic reviews are customarily current with the literature on publication, all such evidence pertains to comparative effectiveness reviews and not to methods reviews, such as ours. An updated search would yield more than 6000 records for us to screen with likely only a few relevant studies. We were aware of additional evaluations that have been published since the date of our literature search, and we have added these into our review. These additional studies have not led to a change in our conclusions. Other recently published articles did not meet our criteria.148 149 150 We do not believe that an updated search would identify sufficient additional studies to change our results. We limited our inclusion to evaluations written in English or French. This may be a limitation of our work, but we are unclear as to how many evaluations might exist in other languages given that few reporting guidelines are translated into other languages. 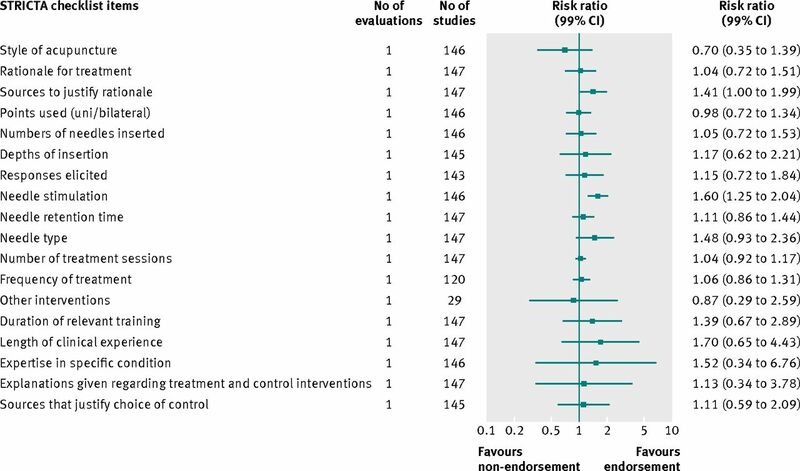 The findings from the 2012 CONSORT systematic review show that, for some CONSORT checklist items, trials published in journals that endorse CONSORT were more completely reported than were trials published before the time of endorsement or in non-endorsing journals.16 17 CONSORT is by far the most extensively evaluated reporting guideline, in contrast to the reporting guidelines covered in this review. At least one other review evaluating CONSORT for harms has been published.151 We examined this review, and studies included in that review but not in ours would not have met our eligibility criteria. Although reporting guidelines might have sufficient face validity to convince some editors to endorse them, we found little evidence to guide this policy. This is in stark contrast, for example, to the evidence required to introduce a new drug in the marketplace. Here, empirical evidence in the form of pivotal randomized trials would be required. Although reporting guidelines are not drugs, they have become increasingly popular, their trajectory continues to increase very quickly, and journal editors and others are making policy decisions about encouraging their use in hundreds if not thousands of journals. Evidence relating to CONSORT, STARD, MOOSE, QUOROM, and STROBE indicates that no standard way exists in which journals endorse reporting guidelines.152 153 154 155 Furthermore, other than including recommendations in their “Instructions to authors,” little is known about what else is done by individual journals to ensure adherence to reporting guidelines. This is an question of fidelity; the effect of endorsement is therefore plagued by different, and not well documented, processes as to the “strength” of endorsement. For example, some journals require a completed reporting guideline checklist as part of the manuscript submission, whereas others only suggest the use of reporting guidelines to facilitate writing of manuscripts. In both instances, whether or how journals check that authors adhere to journals’ recommendations/requirements is not known. One strategy would be to encourage peer reviewers to check adherence to the relevant reporting guideline. A 2012 survey of journals’ instructions to peer reviewers shows that reference to or recommendations to use reporting guidelines during peer review was rare (19 of 116 journals assessed).156 When mentioned, instructions on how to use reporting guidelines during peer review were entirely absent; most journals pointed to CONSORT but few other reporting guidelines. Specifically, surveys of journals’ instructions to authors with respect to endorsement of CONSORT show that guidance is inconsistent and ambiguous and does not provide authors with a strong indication of what is expected of them in terms of using CONSORT during the manuscript submission process.152 153 157 Evidence from this review and a similar CONSORT systematic review suggest much room for improvement in how journals seek to achieve adherence to reporting guidelines.16 17 Developers of reporting guidelines and editors could work together and agree on the optimal way to endorse and implement reporting guidelines across journals (bringing some standardization to the implementation process). A fundamental outcome used by evaluators was the completeness of reporting according to items from the reporting guideline. Ideally, this means that all concepts were reported about a particular reporting guideline checklist item. For example, in the STARD statement, one checklist item covers the “technical specifications of material and methods involved using how and when measurements were taken, and/or cite references for the index tests and reference standard.” For this item, some evaluations separated and tracked reporting information for the index test separately from the reference standard. We had to exclude nine evaluations that did not have any original, unmodified checklist items (that is, guidance items that were split into subcomponents or written with modified interpretation). Furthermore, as noted in tables 1⇑ and 2⇑, more than half of the included evaluations applied modifications to one or more items of the original guidance, negating the inclusion of those items in our analyses. One design used in the literature is the comparison of complete reporting before and after the publication of a reporting guideline. In thinking about this as an intervention and then considering endorsement, endorsement would likely serve as a “stronger” intervention given the need for manuscripts to adhere to a journal’s “Instruction to authors” and subsequent editorial process. However, as mentioned above, the strength of endorsement is crucial and varies across journals. Thus, although not ideal, a journal’s statement about endorsement of a guideline is the best available proxy indicator of a journal’s policy and perhaps authors’ behavior around use of reporting guidelines. In terms of experimental designs, randomizing journals to endorse a reporting guideline or continue with usual editorial policy would be difficult, if not impossible. One method of intervening and evaluating can be with peer reviewers, as mentioned above. To our knowledge, at least one randomized trial by Cobo et al in 2011 has examined the use of reporting guidelines in the peer review process within a single journal that did not endorse any reporting guidelines; it found that manuscripts reviewed using reporting guidelines were of better quality than those that did not use reporting guidelines.158 Although these findings are applicable only to a single journal, more trials like this can provide journals with their own evidence on completeness of reporting and better inform editors as to whether efforts on endorsement and, further, implementation, are having their intended effects. Future evaluations of reporting guidelines should assess unmodified reporting items. Non-experimental designs on the basis of journal endorsement status can help to supplement the evidence base. However, researchers in this area, such as guideline developers, should consider carrying out prospectively designed, controlled studies, like the study by Cobo et al,158 in the context of the journal’s editorial process to provide more robust evidence. The completeness of reporting of only nine of 101 rigorously developed reporting guidelines has been evaluated in relation to journal endorsement status. Items from seven reporting guidelines were quantitatively analyzed by few evaluations each. Insufficient evidence exists to determine the relation between journals’ endorsement of reporting guidelines and the completeness of reporting in published health research reports. Future evaluations of reporting guidelines can take the form of comparisons based on journal endorsement status, but researchers should consider prospectively designed, controlled studies conducted in the context of the journal’s editorial process. We thank Shona Kirtley for information regarding the EQUATOR network search strategy for reporting guidelines, Andra Morrison for peer reviewing the search strategies developed for this review, Becky Skidmore for designing and conducting literature searches, Mary Gauthier and Sophia Tsouros for assisting with screening, Kavita Singh for assisting with screening and data extraction, Misty Pratt for assisting with screening and data extraction and verification, Raymond Daniel for article acquisition and management of bibliographic records within Reference Manager 12 and Distiller SR, Hadeel AlYacoob for assisting with verification of data extraction and analyses, Iveta Simera for contributions to the design of the project and feedback on the manuscript, and the authors of reporting guidelines and journal editors who kindly responded to our requests for information. We thank Stefania Boccia, Nikola Panic, Julien Peron, Benoit You, and other authors of evaluations who responded to our queries and provided raw data for our analyses. Contributors: AS, LS, DM, DGA, LT, AH, JP, AP, and KFS contributed to the conception and design of this review via the published protocol. All authors contributed to the screening, data extraction, analysis, or data interpretation phases of the review. AS and DM drafted the review, and all remaining authors revised it critically for important intellectual content. All authors approved the final manuscript. DM is the guarantor. Funding: This work was supported by a grant from the Canadian Institutes of Health Research (funding research number KSD-111750). The Canadian Institutes of Health Research had no role in the design, data collection, analysis, or interpretation of the data; in the writing of the report; or in the decision to submit this work for publication. DGA is supported by Cancer Research UK, DM by a University of Ottawa research chair, and KFS by FHI360. All researchers are independent from their relevant funding agencies. DGA, DM, and KFS are executive members of the EQUATOR network; AH served as an EQUATOR staff member during this project. The EQUATOR Network is funded by the National Health Service National Library of Health, National Health Service National Institute for Health Research, National Health Service National Knowledge service, United Kingdom Medical Research Council, Scottish Chief Scientist Office, and Pan American Health Organization. Competing interests: All authors have completed the ICMJE uniform disclosure form at www.icmje.org/coi_disclosure.pdf (available on request from the corresponding author) and declare: all authors maintained their independence from the agency that funded this work; no financial relationships with any organizations that might have an interest in the submitted work in the previous three years; no other relationships or activities that could appear to have influenced the submitted work. Ethical approval: This systematic review did not require ethics approval in Canada. Data sharing: Datasets are available on request from the corresponding author. Transparency: The lead author (guarantor) affirms that the manuscript is an honest, accurate, and transparent account of the study being reported; that no important aspects of the study have been omitted; and that any discrepancies from the study as planned (and, if relevant, registered) have been explained. Chan S, Bhandari M. The quality of reporting of orthopaedic randomized trials with use of a checklist for nonpharmacological therapies. J Bone Joint Surg Am2007;89:1970-8. Moher D, Tetzlaff J, Tricco AC, Sampson M, Altman DG. Epidemiology and reporting characteristics of systematic reviews. PLoS Med2007;4:447-55. Smith BA, Lee HJ, Lee JH, Choi M, Jones DE, Bausell RB, et al. Quality of reporting randomized controlled trials (RCTs) in the nursing literature: application of the consolidated standards of reporting trials (CONSORT). Nurs Outlook2008;56(1):31-7. Yesupriya A, Evangelou E, Kavvoura FK, Patsopoulos NA, Clyne M, Walsh MC, et al. Reporting of Human Genome Epidemiology (HuGE) association studies: an empirical assessment. BMC Med Res Methodol2008;8. Zhang D, Yin P, Freemantle N, Jordan R, Zhong N, Cheng KK. An assessment of the quality of randomised controlled trials conducted in China. Trials2008;9:22. Glasziou P, Altman DG, Bossuyt P, Boutron I, Clarke M, Julious S, et al. Reducing waste from incomplete or unusable reports of biomedical research. Lancet2014;383:267-76. Moher D, Schulz KF, Simera I, Altman DG. Guidance for developers of health research reporting guidelines. PLoS Med2010;7(2). Moher D, Weeks L, Ocampo M, Seely D, Sampson M, Altman DG, et al. Describing reporting guidelines for health research: a systematic review. J Clin Epidemiol2011;64:718-42. World Medical Association. Declaration of Helsinki: ethical principles for medical research involving human subjects. JAMA2013;310:2191-4. Begg C, Cho M, Eastwood S, Horton R, Moher D, Olkin I, et al. Improving the quality of reporting of randomized controlled trials: the CONSORT statement. JAMA1996;276:637-9. Moher D, Schulz KF, Altman DG, Lepage L. The CONSORT statement: revised recommendations for improving the quality of reports of parallel group randomized trials. BMC Med Res Methodol2001;1:1-7. Schulz KF, Altman DG, Moher D, for the CONSORT Group. CONSORT 2010 statement: updated guidelines for reporting parallel group randomised trials. BMJ2010;340:c332. Turner L, Shamseer L, Altman DG, Weeks L, Peters J, Kober T, et al. Consolidated standards of reporting trials (CONSORT) and the completeness of reporting of randomised controlled trials (RCTs) published in medical journals. Cochrane Database Syst Rev2012;11:MR000030. Shamseer L, Stevens A, Skidmore B, Turner LA, Altman DG, Hirst A, et al. Does journal endorsement of reporting guidelines influence the completeness of reporting of health research? A systematic review protocol. Syst Rev2012;1:24. Moher D, Liberati A, Tetzlaff J, Altman DG, Altman D, Antes G, et al. Preferred reporting items for systematic reviews and meta-analyses: the PRISMA statement. PLoS Med2009;6:e1000097. Review Manager [computer program]. Version 5.2. The Nordic Cochrane Centre, The Cochrane Collaboration, 2012. Available at http://tech.cochrane.org/revman. Comprehensive Meta Analysis [computer program]. Version 2.2. BioStat, 2013. Little J, Higgins JP, Ioannidis JP, Moher D, Gagnon F, von EE, et al. STrengthening the REporting of Genetic Association Studies (STREGA): an extension of the STROBE statement. PLoS Med2009;6:e22. Kilkenny C, Browne WJ, Cuthill IC, Emerson M, Altman DG. Improving bioscience research reporting: the arrive guidelines for reporting animal research. PloS Biol2010;8:e1000412. Hooijmans CR, Leenaars M, Ritskes-Hoitinga M. A gold standard publication checklist to improve the quality of animal studies, to fully integrate the three Rs, and to make systematic reviews more feasible. Altern Lab Anim2010;38:167-82. Stock-Schroer B, Albrecht H, Betti L, Endler PC, Linde K, Ludtke R, et al. Reporting experiments in homeopathic basic research (REHBaR)—a detailed guideline for authors. Homeopathy2009;98:287-98. Kelly WN, Arellano FM, Barnes J, Bergman U, Edwards IR, Fernandez AM, et al. Guidelines for submitting adverse event reports for publication. Pharmacoepidemiol Drug Saf2007;16:581-7. Berger ML, Mamdani M, Atkins D, Johnson ML. Good research practices for comparative effectiveness research: defining, reporting and interpreting nonrandomized studies of treatment effects using secondary data sources: the ISPOR Good Research Practices for Retrospective Database Analysis Task Force Report—Part I. Value Health2009;12:1044-52. Bossuyt PM, Reitsma JB, Bruns DE, Gatsonis CA, Glasziou PP, Irwig LM, et al. Towards complete and accurate reporting of studies of diagnostic accuracy: the STARD initiative. Clin Chem2003;49:1-6. Bruns DE, Huth EJ, Magid E, Young DS. Toward a checklist for reporting of studies of diagnostic accuracy of medical tests. Clin Chem2000;46:893-5. Donahue SP, Arnold RW, Ruben JB. Preschool vision screening: what should we be detecting and how should we report it? Uniform guidelines for reporting results of preschool vision screening studies. J AAPOS2003;7:314-6. Gardner IA, Nielsen SS, Whittington RJ, Collins MT, Bakker D, Harris B, et al. Consensus-based reporting standards for diagnostic test accuracy studies for paratuberculosis in ruminants. Prev Vet Med2011;101(1-2):18-34. Drummond MF, Jefferson TO, for the BMJ Economic Evaluation Working Party. Guidelines for authors and peer reviewers of economic submissions to the BMJ. BMJ1996;313:275-83. Siegel JE, Weinstein MC, Russell LB, Gold MR. Recommendations for reporting cost-effectiveness analyses: Panel on Cost-Effectiveness in Health and Medicine. JAMA1996;276:1339-41. Davis JC, Robertson MC, Comans T, Scuffham PA. Guidelines for conducting and reporting economic evaluation of fall prevention strategies. Osteoporos Int2011;22:2449-59. Nicholson A, Berger K, Bohn R, Carcao M, Fischer K, Gringeri A, et al. Recommendations for reporting economic evaluations of haemophilia prophylaxis: a nominal groups consensus statement on behalf of the Economics Expert Working Group of the International Prophylaxis Study Group. Haemophilia2008;14:127-32. Talmon J, Ammenwerth E, Brender J, de Keizer N, Nykanen P, Rigby M. STARE-HI-Statement on reporting of evaluation studies in Health Informatics. Int J Med Inf2009;78:1-9. Robinson TN, Patrick K, Eng TR, Gustafson D. An evidence-based approach to interactive health communication: a challenge to medicine in the information age. JAMA1998;280:1264-9. Brown P, Brunnhuber K, Chalkidou K, Chalmers I, Clarke M, Fenton M, et al. How to formulate research recommendations. BMJ2006;333:804-6. Rochon PA, Hoey J, Chan AW, Ferris LE, Lexchin J, Kalkar SR, et al. Financial Conflicts of Interest Checklist 2010 for clinical research studies. Open Med2010;4:e69-91. Research Information Network. Acknowledgement of funders in scholarly journal articles: guidance for UK research funders, authors and publishers. 2008. www.rin.ac.uk/system/files/attachments/Acknowledgement-funders-guidance.pdf. Graf C, Battisti WP, Bridges D, Bruce-Winkler V, Conaty JM, Ellison JM, et al. Good publication practice for communicating company sponsored medical research: the GPP2 guidelines. BMJ2009;339:b4330. Lindon JC, Nicholson JK, Holmes E, Keun HC, Craig A, Pearce JTM, et al. Summary recommendations for standardization and reporting of metabolic analyses. Nat Biotechnol2005;23:833-8. Sung L, Hayden J, Greenberg ML, Koren G, Feldman BM, Tomlinson GA. Seven items were identified for inclusion when reporting a Bayesian analysis of a clinical study. J Clin Epidemiol2005;58:261-8. Dean ME, Coulter MK, Fisher P, Jobst K, Walach H. Reporting data on homeopathic treatments (RedHot): a supplement to CONSORT. Homeopathy2007;96:42-5. Moore HM, Kelly AB, Jewell SD, McShane LM, Clark DP, Greenspan R, et al. Biospecimen reporting for improved study quality (BRISQ). Cancer Cytopathol2011;119:92-101. From the Immunocompromised Host Society. The design, analysis, and reporting of clinical trials on the empirical antibiotic management of the neutropenic patient: report of a consensus panel. J Infect Dis1990;161:397-401. Gnekow AK, for the SIOP Brain Tumor Subcommittee, International Society of Pediatric Oncology. Recommendations of the Brain Tumor Subcommittee for the reporting of trials. Med Pediatr Oncol1995;24:104-8. Lux AL, Osborne JP. A proposal for case definitions and outcome measures in studies of infantile spasms and West syndrome: consensus statement of the West Delphi group. Epilepsia2004;45:1416-28. Scher HI, Eisenberger M, D’Amico AV, Halabi S, Small EJ, Morris M, et al. Eligibility and outcomes reporting guidelines for clinical trials for patients in the state of a rising prostate-specific antigen: recommendations from the Prostate-Specific Antigen Working Group. J Clin Oncol2004;22:537-56. Helmhout PH, Staal JB, Maher CG, Petersen T, Rainville J, Shaw WS. Exercise therapy and low back pain: insights and proposals to improve the design, conduct, and reporting of clinical trials. Spine (Phila Pa 1976)2008;33:1782-8. Aletaha D, Landewe R, Karonitsch T, Bathon J, Boers M, Bombardier C, et al. Reporting disease activity in clinical trials of patients with rheumatoid arthritis: EULAR/ACR collaborative recommendations. Ann Rheum Dis2008;67:1360-4. Higashida RT, Furlan AJ, Roberts H, Tomsick T, Connors B, Barr J, et al. Trial design and reporting standards for intra-arterial cerebral thrombolysis for acute ischemic stroke. Stroke2003;34:e109-37. Diehm N, Baumgartner I, Jaff M, Do DD, Minar E, Schmidli J, et al. A call for uniform reporting standards in studies assessing endovascular treatment for chronic ischaemia of lower limb arteries. Eur Heart J2007;28:798-805. Nedeltchev K, Pattynama PM, Biaminoo G, Diehm N, Jaff MR, Hopkins LN, et al. Standardized definitions and clinical endpoints in carotid artery and supra-aortic trunk revascularization trials. Catheter Cardiovasc Interv2010;76:333-44. Rao SV, Eikelboom J, Steg PG, Lincoff AM, Weintraub WS, Bassand JP, et al. Standardized reporting of bleeding complications for clinical investigations in acute coronary syndromes: a proposal from the academic bleeding consensus (ABC) multidisciplinary working group. Am Heart J2009;158:881-6. Vitek JL, Lyons KE, Bakay R, Benabid AL, Deuschl G, Hallett M, et al. Standard guidelines for publication of deep brain stimulation studies in Parkinson’s disease (Guide4DBS-PD). Mov Disord2010;25:1530-7. Orchard S, Salwinski L, Kerrien S, Montecchi-Palazzi L, Oesterheld M, Stumpflen V, et al. The minimum information required for reporting a molecular interaction experiment (MIMIx). Nat Biotechnol2007;25:894-8. Stephenson EL, Braude PR, Mason C. International community consensus standard for reporting derivation of human embryonic stem cell lines. Regen Med2007;2:349-62. Maxwell KL, Wildes D, Zarrine-Afsar A, De Los Rios MA, Brown AG, Friel CT, et al. Protein folding: defining a “standard” set of experimental conditions and a preliminary kinetic data set of two-state proteins. Protein Sci2005;14:602-16. Deutsch EW, Ball CA, Berman JJ, Bova GS, Brazma A, Bumgarner RE, et al. Minimum information specification for in situ hybridization and immunohistochemistry experiments (MISFISHIE). Nat Biotechnol2008;26:305-12. Harris RK, Becker ED, Cabral De Menezes SM, Granger P, Hoffman RE, Zilm KW. Further conventions for NMR shielding and chemical shifts IUPAC recommendations 2008. Solid State Nucl Magn Reson2008;33(3):41-56. Markley JL, Bax A, Arata Y, Hilbers CW, Kaptein R, Sykes BD, et al. Recommendations for the presentation of NMR structures of proteins and nucleic acids: IUPAC-IUBMB-IUPAB Inter-Union Task Group on the Standardization of Data Bases of Protein and Nucleic Acid Structures Determined by NMR Spectroscopy. J Biomol NMR1998;12(1):1-23. Morton D, Kemp RK, Francke-Carroll S, Jensen K, McCartney J, Monticello TM, et al. Best practices for reporting pathology interpretations within GLP toxicology studies. Toxicol Pathol2006;34:806-9. Taylor CF, Paton NW, Lilley KS, Binz PA, Julian RK Jr, Jones AR, et al. The minimum information about a proteomics experiment (MIAPE). Nat Biotechnol2007;25:887-93. Taylor CF, Binz PA, Aebersold R, Affolter M, Barkovich R, Deutsch EW, et al. Guidelines for reporting the use of mass spectrometry in proteomics. Nat Biotechnol2008;26:860-1. Idris AH, Becker LB, Ornato JP, Hedges JR, Bircher NG, Chandra NC, et al. Utstein-style guidelines for uniform reporting of laboratory CPR research. Circulation1996;94:2324-36. Von Elm E, Altman DG, Egger M, Pocock SJ, Gotzsche PC, Vandenbroucke JP. The Strengthening the Reporting of Observational Studies in Epidemiology (STROBE) statement: guidelines for reporting observational studies. PLoS Med2007;4:e296. Tooth L, Ware R, Bain C, Purdie DM, Dobson A. Quality of reporting of observational longitudinal research. Am J Epidemiol2005;161:280-8. Gallo V, Egger M, McCormack V, Farmer PB, Ioannidis JPA, Kirsch-Volders M, et al. STrengthening the Reporting of OBservational studies in Epidemiology—Molecular Epidemiology (STROBE-ME): an extension of the STROBE statement. Eur J Clin Invest2012;42:1-16. McShane LM, Altman DG, Sauerbrei W, Taube SE, Gion M, Clark GM. REporting recommendations for tumour MARKer prognostic studies (REMARK). Eur J Cancer2005;41:1690-6. Dixon WG, Carmona L, Finckh A, Hetland ML, Kvien TK, Landewe R, et al. EULAR points to consider when establishing, analysing and reporting safety data of biologics registers in rheumatology. Ann Rheum Dis2010;69:1596-602. Wolfe F, Lassere M, Van Der Heijde D, Stucki G, Suarez-Almazor M, Pincus T, et al. Preliminary core set of domains and reporting requirements for longitudinal observational studies in rheumatology. J Rheumatol1999;26:484-9. Zakrzewska JM, Lopez BC. Quality of reporting in evaluations of surgical treatment of trigeminal neuralgia: recommendations for future reports. Neurosurgery2003;53:110-20. DeVivo MJ, Biering-Sorensen F, New P, Chen Y. Standardization of data analysis and reporting of results from the International Spinal Cord Injury Core Data Set. Spinal Cord2011;49:596-9. Des Jarlais DC, Lyles C, Crepaz N. Improving the reporting quality of nonrandomized evaluations of behavioral and public health interventions: the TREND Statement. Am J Public Health2004;94:361-6. Stone SP, Cooper BS, Kibbler CC, Cookson BD, Roberts JA, Medley GF, et al. The ORION statement: guidelines for transparent reporting of outbreak reports and intervention studies of nosocomial infection. Lancet Infect Dis2007;7:282-8. Strevel EL, Chau NG, Pond GR, Murgo AJ, Ivy PS, Siu LL. Improving the quality of abstract reporting for phase I cancer trials. Clin Cancer Res2008;14:1782-7. Przepiorka D, Weisdorf D, Martin P, Klingemann HG, Beatty P, Hows J, et al. 1994 Consensus Conference on Acute GVHD Grading. Bone Marrow Transplant1995;15:825-8. Cheson BD, Bennett JM, Kopecky KJ, Buchner T, Willman CL, Estey EH, et al. Revised recommendations of the International Working Group for Diagnosis, Standardization of Response Criteria, Treatment Outcomes, and Reporting Standards for Therapeutic Trials in Acute Myeloid Leukemia. J Clin Oncol2003;21:4642-9. Elliott R, Fischer CT, Rennie DL. Evolving guidelines for publication of qualitative research studies in psychology and related fields. Br J Clin Psychol1999;38:215-29. Smith L, Rosenzweig L, Schmidt M. Best practices in the reporting of participatory action research: embracing both the forest and the trees. Couns Psychol2010;38:1115-38. Davidoff F, Batalden P, Stevens D, Ogrinc G, Mooney S, Standards for QUality Improvement Reporting Excellence Development Group. Publication guidelines for quality improvement studies in health care: evolution of the SQUIRE project. J Gen Intern Med2008;23:2125-30. Asilomar Working Group on Recommendations for Reporting of Clinical Trials in the Biomedical Literature. Checklist of information for inclusion in reports of clinical trials. Ann Intern Med1996;124:741-3. Campbell MK, Elbourne DR, Altman DG, for the CONSORT Group. CONSORT statement: extension to cluster randomised trials. BMJ2004;328:702-8. Campbell MK, Grimshaw JM, Elbourne DR. Intracluster correlation coefficients in cluster randomized trials: empirical insights into how should they be reported. BMC Med Res Methodol2004;4:9. Piaggio G, Elbourne DR, Altman DG, Pocock SJ, Evans SJ, for the CONSORT Group. Reporting of noninferiority and equivalence randomized trials: an extension of the CONSORT statement [correction in: JAMA 2006;296:1842]. JAMA2006;295:1152-60. Krzyzanowska MK, Pintilie M, Brezden-Masley C, Dent R, Tannock IF. Quality of abstracts describing randomized trials in the proceedings of American Society of Clinical Oncology meetings: guidelines for improved reporting. J Clin Oncol2004;22:1993-9. Ioannidis JP, Evans SJ, Gotzsche PC, O’Neill RT, Altman DG, Schulz K, et al. 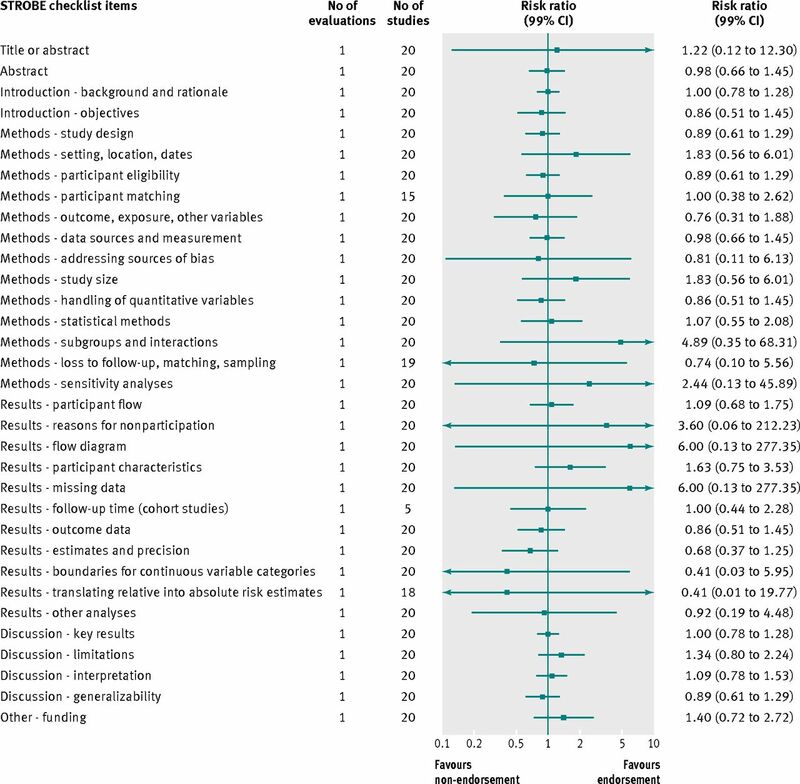 Better reporting of harms in randomized trials: an extension of the CONSORT statement. Ann Intern Med2004;141:781-8. Boutron I, Moher D, Altman DG, Schulz KF, Ravaud P, for the CONSORT Group. Methods and processes of the CONSORT Group: example of an extension for trials assessing nonpharmacologic treatments. Ann Intern Med2008;148:W60-6. Gagnier JJ, Boon H, Rochon P, Moher D, Barnes J, Bombardier C, et al. Reporting randomized, controlled trials of herbal interventions: an elaborated CONSORT statement. Ann Intern Med2006;144:364-7. Wu T-X, Li Y-P, Bian Z-X, Li T-Q, Li J, Dagenais S, et al. Consolidated standards for reporting trials of traditional Chinese medicine (CONSORT for TCM) (for solicitation of comments). Chinese Journal of Evidence-Based Medicine2007;7:625-30. MacPherson H, White A, Cummings M, Jobst KA, Rose K, Niemtzow RC, et al. Standards for Reporting Interventions in Controlled Trials of Acupuncture: the STRICTA recommendations. J Altern Complement Med2002;8:85-9. Special report: measuring and reporting pain outcomes in randomized controlled trials. Technol Eval Cent Assess Program Exec Summ2006;21:1-2. Bousquet PJ, Brozek J, Bachert C, Bieber T, Bonini S, Burney P, et al. The CONSORT statement checklist in allergen-specific immunotherapy: a GA2LEN paper. Allergy2009;64:1737-45. O’Connor AM, Sargeant JM, Gardner IA, Dickson JS, Torrence ME, Consensus MP, et al. The REFLECT statement: methods and processes of creating reporting guidelines for randomized controlled trials for livestock and food safety by modifying the CONSORT statement. Zoonoses Public Health2010;57):95-104. Rundback JH, Sacks D, Kent KC, Cooper C, Jones D, Murphy T, et al, for the American Heart Association. Guidelines for the reporting of renal artery revascularization in clinical trials. Circulation2002;106:1572-85. Goldberg SN, Grassi CJ, Cardella JF, Charboneau JW, Dodd GD III, Dupuy DE, et al. Image-guided tumor ablation: standardization of terminology and reporting criteria. Radiology2005;235:728-39. APA Publications and Communications Board Working Group on Journal Article Reporting Standards. Reporting standards for research in psychology: why do we need them? What might they be? Am Psychol2008;63:839-51. Howley L, Szauter K, Perkowski L, Clifton M, McNaughton N. Quality of standardised patient research reports in the medical education literature: review and recommendations. Med Educ2008;42:350-8. Moher D, Cook DJ, Eastwood S, Olkin I, Rennie D, Stroup DF. Improving the quality of reports of meta-analyses of randomised controlled trials: the QUOROM statement. Lancet1999;354:1896-900. Stroup DF, Berlin JA, Morton SC, Olkin I, Williamson GD, Rennie D, et al, for the Meta-analysis Of Observational Studies in Epidemiology (MOOSE) group. 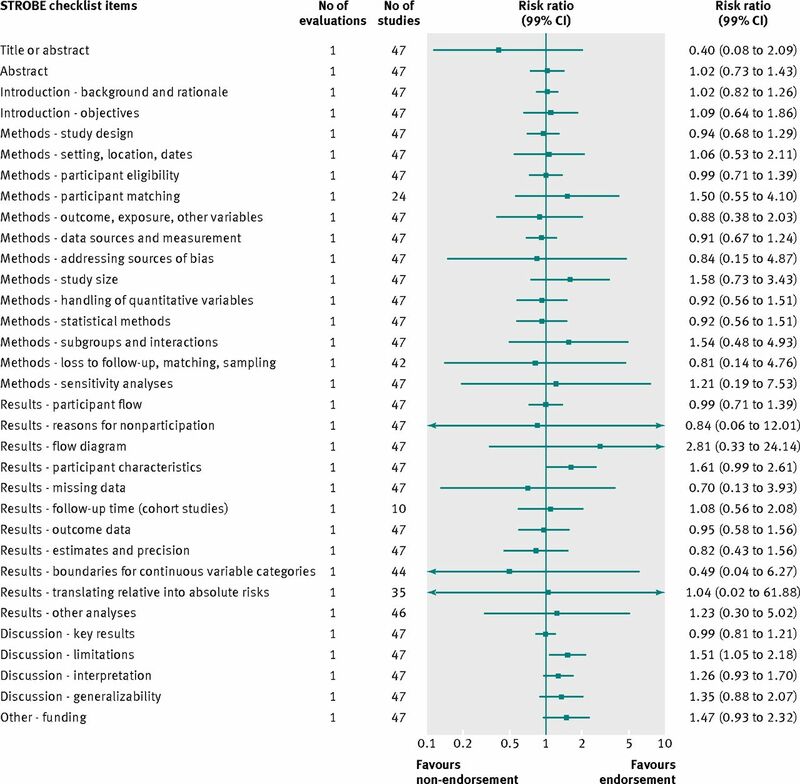 Meta-analysis of observational studies in epidemiology: a proposal for reporting. JAMA2000;283:2008-12. Kottner J, Audige L, Brorson S, Donner A, Gajewski BJ, Hrobjartsson A, et al. Guidelines for Reporting Reliability and Agreement Studies (GRRAS) were proposed. J Clin Epidemiol2011;64:96-106. Castren M, Karlsten R, Lippert F, Christensen EF, Bovim E, Kvam AM, et al. Recommended guidelines for reporting on emergency medical dispatch when conducting research in emergency medicine: the Utstein style. Resuscitation2008;79:193-7. Janssens AC, Ioannidis JP, van Duijn CM, Little J, Khoury MJ, for the GRIPS Group. Strengthening the reporting of Genetic RIsk Prediction Studies: the GRIPS Statement. PLoS Med2011;8:e1000420. Little J, Bradley L, Bray MS, Clyne M, Dorman J, Ellsworth DL, et al. Reporting, appraising, and integrating data on genotype prevalence and gene-disease associations. Am J Epidemiol2002;156:300-10. Ad Hoc Committee on Reporting Standards, Society for Vascular Surgery/North American Chapter, International Society for Cardiovascular Surgery. Suggested standards for reports dealing with lower extremity ischemia. J Vasc Surg1986;4:80-94. Hollander JE, Blomkalns AL, Brogan GX, Diercks DB, Field JM, Garvey JL, et al. Standardized reporting guidelines for studies evaluating risk stratification of emergency department patients with potential acute coronary syndromes. Ann Emerg Med2004;44:589-98. Horstkotte D, Lengyel M, Mistiaen WP, Piper C, Voller H. Recommendations for reporting morbid events after heart valve surgery. J Heart Valve Dis2005;14(1):1-7. Landis RC, Murkin JM, Stump DA, Baker RA, Arrowsmith JE, De Somer F, et al. Consensus statement: minimal criteria for reporting the systemic inflammatory response to cardiopulmonary bypass. Heart Surg Forum2010;13:E116-23. Cummins RO, Chamberlain DA, Abramson NS, Allen M, Baskett PJ, Becker L, et al. Recommended guidelines for uniform reporting of data from out-of-hospital cardiac arrest: the utstein style. A statement for health professionals from a task force of the American Heart Association, the European Resuscitation Council, and Heart and Stroke Foundation of Canada, and the Australian Resuscitation Council. Circulation1991;84:960-75. Cummins RO, Chamberlain D, Hazinski MF, Nadkarni V, Kloeck W, Kramer E, et al. Recommended guidlines for reviewing, reporting, and conducting research on in-hospital resuscitation: the in-hospital ‘Utstein style’. Acad Emerg Med1997;4:603-27. Zaritsky A, Nadkarni V, Hazinski MF, Foltin G, Quan L, Wright J, et al. Recommended guidelines for uniform reporting of pediatric advanced life support: the pediatric utstein style. Ann Emerg Med1995;26:487-503. Langhelle A, Nolan J, Herlitz J, Castren M, Wenzel V, Soreide E, et al. Recommended guidelines for reviewing, reporting, and conducting research on post-resuscitation care: the Utstein style. Resuscitation2005;66:271-83. Mason EE, Amaral J, Cowan GS Jr, Deitel M, Gleysteen JJ, Oria HE. Standards for reporting results. Obes Surg1994;4:56-65. Standards Committee, American Society for Bariatric Surgery. Guidelines for reporting results in bariatric surgery. Obes Surg1997;7:521-2. Benchimol EI, Manuel DG, To T, Griffiths AM, Rabeneck L, Guttmann A. Development and use of reporting guidelines for assessing the quality of validation studies of health administrative data. J Clin Epidemiol2011;64:821-9. Herman PM, Craig BM, Caspi O. Is complementary and alternative medicine (CAM) cost-effective? A systematic review. BMC Complement Altern Med2005;5. Jefferson T, Smith R, Yee Y, Drummond M, Pratt M, Gale R. Evaluating the BMJ guidelines for economic submissions: prospective audit of economic submissions to BMJ and the Lancet. JAMA1998;280:275-7. Haidich AB, Birtsou C, Dardavessis T, Tirodimos I, Arvanitidou M. The quality of safety reporting in trials is still suboptimal: survey of major general medical journals. J Clin Epidemiol2011;64:124-35. Turner LA, Singh K, Garritty C, Tsertsvadze A, Manheimer E, Wieland LS, et al. An evaluation of the completeness of safety reporting in reports of complementary and alternative medicine trials. BMC Complement Altern Med2011;11:67. Lee PE, Fischer HD, Rochon PA, Gill SS, Herrmann N, Bell CM, et al. Published randomized controlled trials of drug therapy for dementia often lack complete data on harm. J Clin Epidemiol2008;61:1152-60. Ernst E, Hung SK, Clement Y. NCCAM-funded RCTs of herbal medicines: an independent, critical assessment. Perfusion2011;24:89-102. Biondi-Zoccai GG, Lotrionte M, Abbate A, Testa L, Remigi E, Burzotta F, et al. Compliance with QUOROM and quality of reporting of overlapping meta-analyses on the role of acetylcysteine in the prevention of contrast associated nephropathy: case study. BMJ2006;332:202-6. Poolman RW, Abouali JA, Conter HJ, Bhandari M. Overlapping systematic reviews of anterior cruciate ligament reconstruction comparing hamstring autograft with bone-patellar tendon-bone autograft: why are they different? J Bone Joint Surg Am2007;89:1542-52. Freeman K, Szczepura A, Osipenko L. Non-invasive fetal RHD genotyping tests: a systematic review of the quality of reporting of diagnostic accuracy in published studies. Eur J Obstet Gynecol Reprod Biol2009;142:91-8. Mahoney J, Ellison J. Assessing the quality of glucose monitor studies: a critical evaluation of published reports. Clin Chem2007;53:1122-8. Selman TJ, Morris RK, Zamora J, Khan KS. The quality of reporting of primary test accuracy studies in obstetrics and gynaecology: application of the STARD criteria. BMC Womens Health2011;11:8. Smidt N, Rutjes AW, van der Windt DA, Ostelo RW, Bossuyt PM, Reitsma JB, et al. The quality of diagnostic accuracy studies since the STARD statement: has it improved? Neurology2006;67:792-7. Coppus SF, van der Veen F, Bossuyt PM, Mol BW. Quality of reporting of test accuracy studies in reproductive medicine: impact of the Standards for Reporting of Diagnostic Accuracy (STARD) initiative. Fertil Steril2006;86:1321-9. Johnson ZK, Siddiqui MA, Azuara-Blanco A. The quality of reporting of diagnostic accuracy studies of optical coherence tomography in glaucoma. Ophthalmology2007;114:1607-12. Krzych LJ, Liszka L. No improvement in studies reporting the diagnostic accuracy of B-type natriuretic peptide. Med Sci Monit2009;15:SR5-14. Paranjothy B, Shunmugam M, Azuara-Blanco A. The quality of reporting of diagnostic accuracy studies in glaucoma using scanning laser polarimetry. J Glaucoma2007;16:670-5. Hammerschlag R, Milley R, Colbert A, Weih J, Yohalem-Ilsley B, Mist S, et al. Randomized controlled trials of acupuncture (1997-2007): an assessment of reporting quality with a CONSORT- and STRICTA-based instrument. Evid Based Complement Alternat Med2011;2011:pii:183910. Delaney M, Meyer E, Cserti-Gazdewich C, Haspel RL, Lin Y, Morris A, et al. A systematic assessment of the quality of reporting for platelet transfusion studies. Transfusion2010;50:2135-44. 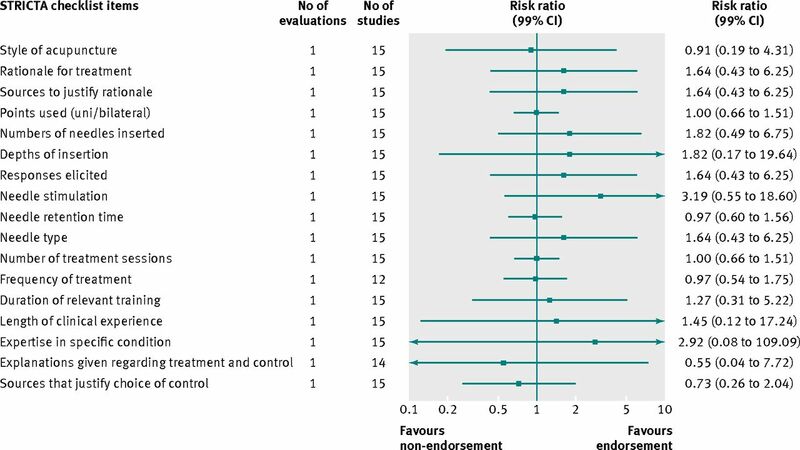 Peron J, Maillet D, Gan HK, Chen EX, You B. Adherence to CONSORT adverse event reporting guidelines in randomized clinical trials evaluating systemic cancer therapy: a systematic review. J Clin Oncol2013;31:3957-63. Cornelius VR, Sauzet O, Williams JE, Ayis S, Farquhar-Smith P, Ross JR, et al. Adverse event reporting in randomised controlled trials of neuropathic pain: considerations for future practice. Pain2013;154:213-20. Tunis AS, McInnes MD, Hanna R, Esmail K. Association of study quality with completeness of reporting: have completeness of reporting and quality of systematic reviews and meta-analyses in major radiology journals changed since publication of the PRISMA statement? Radiology2013;269:413-26. Fleming PS, Seehra J, Polychronopoulou A, Fedorowicz Z, Pandis N. A PRISMA assessment of the reporting quality of systematic reviews in orthodontics. Angle Orthod2013;83:158-63. Panic N, Leoncini E, de Belvis G, Ricciardi W, Boccia S. Evaluation of the endorsement of the preferred reporting items for systematic reviews and meta-analysis (PRISMA) statement on the quality of published systematic review and meta-analyses. Plos One2013;8:e83138. Ghimire S, Kyung E, Lee H, Kim E. Oncology trial abstracts showed suboptimal improvement in reporting: a comparative before-and-after evaluation using CONSORT for Abstract guidelines. J Clin Epidemiol2014;67:658-66. Parsons NR, Hiskens R, Price CL, Achten J, Costa ML. A systematic survey of the quality of research reporting in general orthopaedic journals. J Bone Joint Surg Br2011;93:1154-9. Faggion CM Jr, Tu YK, Giannakopoulos NN. Reporting adverse events in randomized controlled trials in periodontology: a systematic review. J Clin Periodontol2013;40:889-95. Kim KH, Kang JW, Lee MS, Lee JD. Assessment of the quality of reporting for treatment components in Cochrane reviews of acupuncture. BMJ Open2014;4:e004136. Bastuji-Garin S, Sbidian E, Gaudy-Marqueste C, Ferrat E, Roujeau JC, Richard MA, et al. Impact of STROBE statement publication on quality of observational study reporting: interrupted time series versus before-after analysis. Plos One2013;8:e64733. 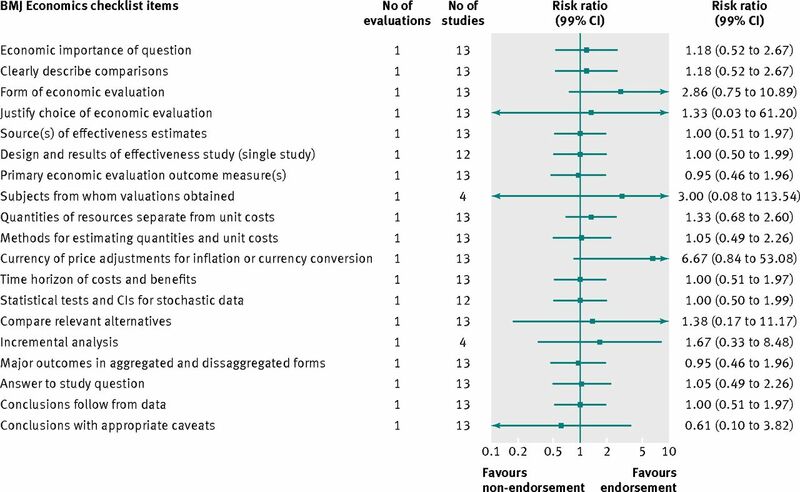 Hodkinson A, Kirkham JJ, Tudur-Smith C, Gamble C. Reporting of harms data in RCTs: a systematic review of empirical assessments against the CONSORT harms extension. BMJ Open2013;3:e003436. Altman DG. Endorsement of the CONSORT statement by high impact medical journals: survey of instructions for authors. BMJ2005;330:1056-7. Hopewell S, Altman DG, Moher D, Schulz KF. Endorsement of the CONSORT Statement by high impact factor medical journals: a survey of journal editors and journal ‘Instructions to Authors’. Trials2008;9:20. Smidt N, Overbeke J, De VH, Bossuyt P. Endorsement of the STARD Statement by biomedical journals: survey of instructions for authors. Clin Chem2007;53:1983-5. Meerpohl JJ, Wolff RF, Niemeyer CM, Antes G, von Elm E. Editorial policies of pediatric journals: survey of instructions for authors. Arch Pediatr Adolesc Med2010;164:268-72. Hirst A, Altman DG. Are peer reviewers encouraged to use reporting guidelines? A survey of 116 health research journals. Plos One2012;7:e35621. Shamseer L, Theilman J, Turner L, Hopewell S, Altman DG, Schulz KF, et al. Update on the endorsement of CONSORT by high impact factor journals: a survey of journal editors and instructions to authors. Seventh International Congress on Peer Review and Biomedical Publication, Chicago, USA, September 8-10, 2013. Cobo E, Cortes J, Ribera JM, Cardellach F, Selva-O’Callaghan A, Kostov B, et al. 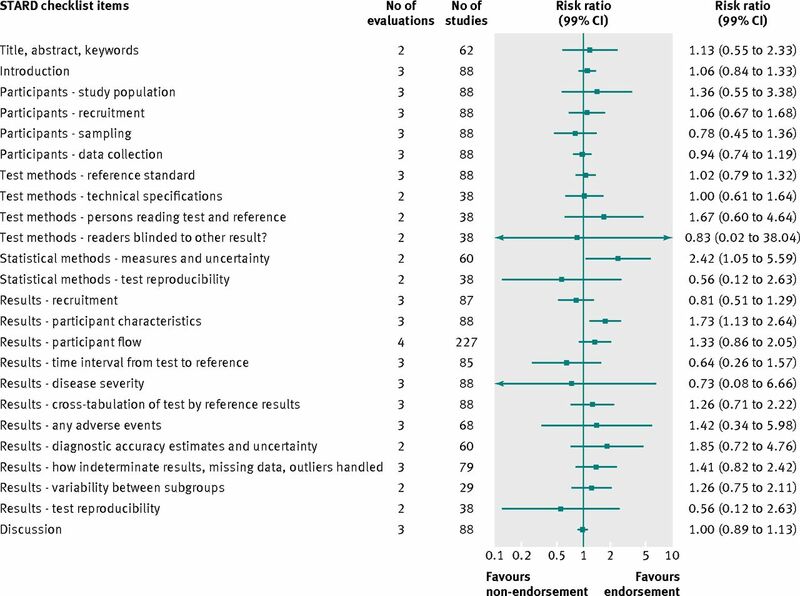 Effect of using reporting guidelines during peer review on quality of final manuscripts submitted to a biomedical journal: masked randomised trial. BMJ2011;343:d6783. Canadian Institutes of Health Research. About knowledge translation. 2014. www.cihr-irsc.gc.ca/e/29418.html. Improved Clinical Effectiveness through Behavioural Research Group (ICEBeRG). Designing theoretically-informed implementation interventions. Implement Sci2006;1:4. French SD, Green SE, O’Connor DA, McKenzie JE, Francis JJ, Michie S, et al. Developing theory-informed behaviour change interventions to implement evidence into practice: a systematic approach using the Theoretical Domains Framework. Implement Sci2012;7:38. Fleming PS, Seehra J, Polychronopoulou A, Fedorowicz Z, Pandis N. Cochrane and non-Cochrane systematic reviews in leading orthodontic journals: a quality paradigm? Eur J Orthod2013;35:244-8.